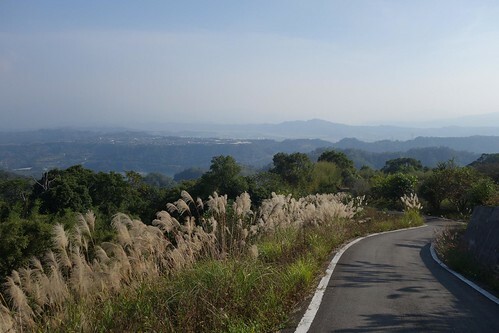 My friend Michael Fahey, one of the island's most experienced cyclists, took me along the bike paths around the south side of Taipei, marveling at the totally clear skies after the weeks of rain all over the island. Pausing for a break, we discovered that both of us had forgotten our smartphones. D'oh. Our first goal was the intersection of the 106 and the 106甲 outside of Taipei in Shenken, a popular meet-up site for cyclists. As you can tell. A block of eateries and convenience stores has arisen to service the endless flow of riders and motorcyclists. The 106甲 heads off to the right. We followed it to Pinglin. We stopped at the picturesque bridge in Shihding. 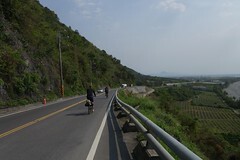 Basically from convenience stores to the top of the 106甲 it is roughly 15 kms of climbing. Not particularly steep, but a slog nonetheless. Hey, haven't I lost weight? Over 10 kilos since December. The power of low carb. Lots of switchbacks in 16 kms. Michael shows off his old school gloves. The views are excellent. In the center of the pic traffic lines up to enter the tunnel to I-lan. 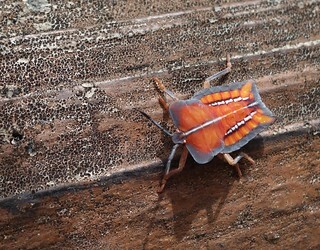 ...and this beautiful baby walking stick. I always consider it a fortunate day when I find a walking stick. 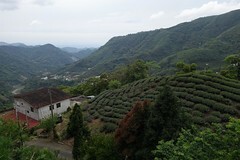 As you come back down towards Pinglin, the views over the tea fields are lovely. The road is lined with farmhouses. Pinglin town is a madhouse on the weekends, filled with speeding cars and the roar of motorcycles. Avoid if possible. Lunch: fried tofu and matcha green tea with "milk". I had two, they were delicious. Lots of hikers out and about in clubs and club uniforms. Leaving Pinglin, we returned to the 106甲 and then turned and ascended the 北42, a lovely local road. There were three long ascents, the first being the steepest, and the third the longest. 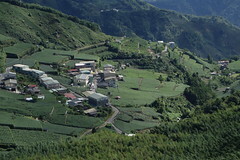 It goes through some lovely forested territory, interspersed with tea and fruit farms. The 北42 is twenty kilometers devoid of traffic and lovely. Highly recommended. Like Alishan, but 1200 meters lower. The descent is excellent and we found ourselves in this tiny little village just above Shuangxi, where we grabbed some drinks. Unfortunately I blew a couple of tubes and we decided to divert from our original destination of Daxi on the coast to the beach town of Fulong where it might be possible to get tubes. We followed the 2丙 from Shuangxi out to the 2. Here is a shot on the 2丙 as a fisherman searches for dinner in the afternoon. Wonder what she's seen with those eyes. Fulong is a madhouse on the weekends. Avoid if at all possible. We lucked into a hotel room and then visited friends in town. Fulong is great when there are no tourists. Like on Sunday morning before the Taipei crush arrives. At a local breakfast shop. We stopped in Ao Di on the coast at the entrance to the 102甲 to wait for a friend who never showed, and while we waited, Michael pointed out some of the strange whisky names to me. Nick Daddy whisky? First we climbed up the pleasant and enjoyable 102甲. Michael watches me take a photo. Lots of romantic photo ops on the 102甲. The 北37 was brutal. Absolutely brutal. Sun burning down in accordance with the evil plans of the bike gods, we surmounted three kilometers of 15%+ grades; this last one pictured here was probably over 20%. By the time I got to the top I was blacking out, which is why I didn't take many pictures. All I can say is friends do not let friends ride the 北37. The downhill to the river was enjoyable enough, with good mountain views and views out over the ocean. But I was too busy struggling to breathe to take many pictures. 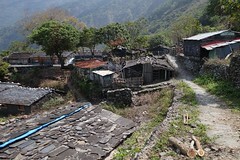 At the bottom, just outside Ruifang town, it finally flattens out and meekly follows the river. In Ruifang town near the Beautiful Cuisine Street. Crowded with day trippers from Taipei, Ruifang is always full of things to eat. We stopped for Vietnamese, threw the bikes on the train, and headed for Taipei. It had been a great weekend of riding in beautiful places. Many thanks to my man Michael for making it all possible and coming up with a great route plan! Shucks! Wish I could have gone with you guys. I split taking turns teaching Saturdays with another expat and this was my turn to teach this weekend. Thanks for the pics and review of the roads. Great tour. I can't wait to come back to Taiwan and get my cycle on the road. Chen Shui-bian back to the DPP?